In this short video interview, Joan Ocean who is quite well known among the Cetacean community swimming around in Earth's Waters talks to Lilo Mace about her experiences with these amazing telepathic beings over the last 33 years or so ... ever since she first became aware of their highly intelligent, ever loving, multidimensional nature. 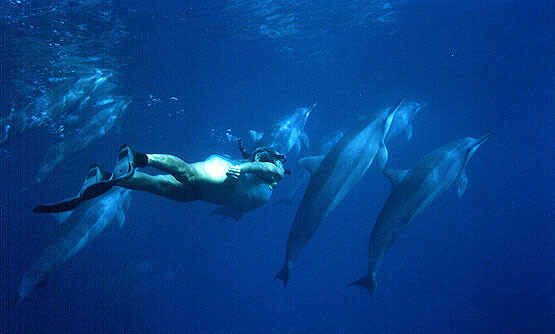 She recounts experiences of people swimming with these dolphins and whales ... and how they are healed and energy blockages are removed from their bodies by the sonar frequencies emanating from them ! The dolphins and whales are calling us into the ocean ! They want to meet us, to introduce us to their world, and to swim with us into the unknown. They are intelligent friends who exemplify qualities we value-- cooperation, harmony, peace, joyfulness, good health, beauty, wisdom, supple movement, grace and unconditional love. The dolphins and whales are approaching us around the globe, filling our minds with visions of freedom, and interacting with us to encourage us to attain many life-enhancing qualities. I am a counseling psychologist by training and I have understood from the beginning of my human- dolphin connection that experiences with the dolphins and whales are teachings about human potentials and spiritual unfoldment. The calling that I have received from the cetaceans is a call to people about our unlimited essence and our capacity to experience love more fully. This is what the dolphins have been showing me by their example as I swim with them almost every day. It has changed my life and it has affected the community of friends who live in my neighborhood and swim with me. On this web site, I will continue to share with you the teachings of the dolphins and whales. Since 1989 I have lived with three pods, or families, of more than two hundred wild Hawaiian Spinner dolphins, Stenella longirostris. I have logged over 6,000 hours in the water — listening to the dolphins, watching them, mimicking them, filming, recording, documenting them, and enriching my own life because of them. I have learned that cetaceans communicate in a way that requires an entirely different mind set than the human cognitive-thinking model. Rather than in words and sentences, dolphins communicate through vibrations, through sonar and synchronized movement, through acoustic images, feelings, sounds, and group-energy fields. They work with the electromagnetic grids of the planet, using these underwater pathways to send messages for miles beneath the sea. They know how to access multiple dimensions. This means they are simultaneously experiencing life in the ocean and life in an ontological world of multi-level subtle realities. As they swim with me, I am often fascinated by their ability to be wonderful three-dimensional physical friends, while they also interact with vibrational holograms that take them to fourth and fifth-dimensional worlds. They serve as inspirational examples to us of the possibilities existing beyond our present belief systems. What they are doing, and what they are teaching us, is exactly what we humans will be doing in the twenty-first century. This is why there is such a yearning in people to be with dolphins and to learn from them — we sense the importance and the timeliness of their wisdom. When we immerse ourselves in the ocean for hours, we are transported into another dimensional world. Everything we see and feel is new and unknown, relative to our earthbound lives. As we swim along we see the blueness ahead of us. We see shapes and forms moving in the current before us. We look ahead and we cannot see our own bodies. It feels like free-floating in outer space! In addition to living in another world, the Hawaiian Spinner dolphins are at One with nature. They live in a state of Love that suspends judgment, anger and retaliation, and their abilities to use more of their physical, sensory, and intelligence potentials reminds us that we can do that too. The dolphins operate out of a different paradigm than the human race. They have not been raised in a culture that requires primarily rational thinking. They know there is much more than that. We can learn their ways and enrich ourselves. As we broaden our attitudes, the physiology of our bodies will change also. There are many wonderful adventures awaiting our entrance into the dolphin world. As humans we want happiness -- the dolphins have found this. We want peace of mind -- when we swim with wild dolphins, we find it with them. We want beauty and love - the dolphins create this vibrationally, shaping their own habitats. They feel vibrations, create holographic works of art all around themselves, and then play among them. The dolphins have taken me through a very precise and methodical "course of study," compelling me to open to their wisdom and set aside my old limiting beliefs about who I am as a human being on Earth at this time in the history of the Universe. They have helped me expand into near and distant worlds. These are the experiences I will share with you, in the hope that some of the behaviors and communications of the dolphins will inspire you to further develop them into healing modalities for people and our planet. 1.) To swim and dive. Taking care of Nature and it takes care of us. We are more than our physical bodies, we are able to communicate. Sound (vibrations) can heal us. Use them, study them. Breathe deeply all the time and avoid going places where you can't. Sleep on your own schedule. Eat what's in your environment. Always smile it makes you more beautiful. Eye contact is a communication between souls. You have control over your emotions – express the good ones, analyze the bad ones. Don't blame others. Play more than anything else, no matter where you are! Share your feelings of love with everyone. Don't be stingy. Be fearless and face the things that worry you with Faith. Use your 6th sense and beyond. Spirit Guides, Angels, ETs ... Multidimensional Beings ! The Cove : A Documentary About Dolphins Being Hunted !